In February of 2018 I embarked on my first ever solo trip and joined a co-working retreat for a whole month overflowing with productivity and adventure. I met some amazing and ridiculously inspiring people one of which was Steve Walsh, a photographer from Montreal. He finally had a second to sift through all the thousands of photos he took and edit his favourite ones. 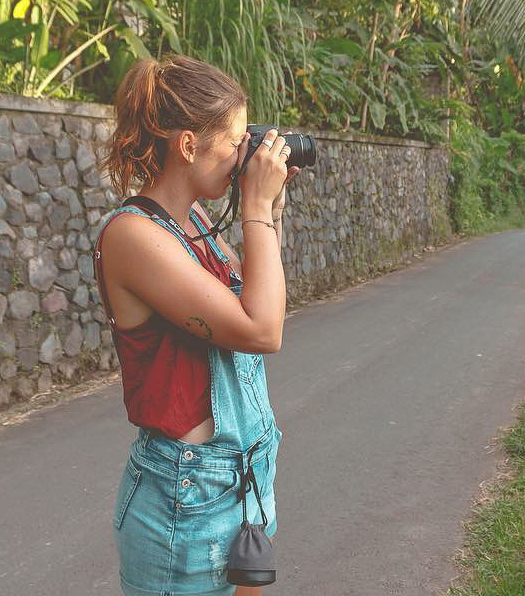 500 photos that fully capture the essence of Bali. And so my journey began. I sold my stuff, began to travel and find ways to spend more time outdoors and I haven’t looked back since. Now hiking is part of my life and I was so excited to receive my first ever pair of hiking boots from Hi-Tec. Like a kid on Christmas kind of excited. After just a week of having them I laced them up and embarked on another first, another leap, my first overnight hike. This is a long awaited blog, I have been meaning to write for a few months so here it finally is. Anyone new to my page, you’re about to find out how I work remotely, travel the world and spend so much time outdoors. How just this year, I have spent a month living in Bali, a month living in Sicily and coming up, a month living in Cape Town. When approaching Tivoli on the train, we rounded a tunnel and were greeted by what I can only describe as magical. A big cascading waterfall fell from the hills, which were topped with old Italian houses, laundry hanging off balconies and houses precariously placed on the hillside. A beautiful arched bridge and a cathedral bell tower topping off the magic. The streets were a quiet delight after the bustle of Rome. It was like we were transported to an entirely different place and time. In light of world photographers day which was yesterday, I thought I'd write about the power of inspiration. A feeling I try to surround myself with and create as often as possible. I find an infinite amount of things inspire me and the list seems to endlessly grow. Be prepared for the onset of my wealth of knowledge and for pretty pictures of Knysna Lourie's and picturesque streams. This trail seems to be somewhat of a hidden wonder. Recently I found myself on a trail I’ve been wanting to check out for a while. Coming from Johannesburg, a grassland biome, the lush green and ever damp trails that The Garden Route has to offer, still leave me in absolute awe every time. A novelty that will never get old. A few weeks ago I heard via the grapevine that a group of rehabilitated penguins would be released back into the wild on one of Plettenberg Bays beaches. How exciting? I now live in a place where the rehabilitation and conservation of animals is right at my finger tips! It's so funny, that whole, creative ideas come to you when you least expect them and in the shower thing, both totally true. When you're 26 and learning to do things for the first time, asking questions is so intimidating. Doing things for the first time as you get older seems to get clunkier and messier. It's like fumbling your away around the dark. One thought that seems to consistently pop into my head is "am I doing this right?" The absolute best thing about the city of Cape Town has to be how accessible it is to immerse yourself in Nature. One of the most notable and well-known trails and mountains other than the infamous Table Mountain is Lion's Head. I think I have managed to schedule in some time to do this hike almost every time I have visited the city and never once has it disappointed. Working for yourself and remotely you are your own boss, secretary, cleaner, copyrighter, and all round superhuman! You are your best resource but in my case you can also be your own worst enemy. Canoeing is definitely one of my favourite outdoor activities so far. Water, Check! Sunshine, Check! The Peace and Quiet of Nature, Check! Throw in a little time to reflect and you’ve got me hook, line and sinker. This week was a really weird one! Seems I've been having a lot of those lately. It consisted of me trying to push and pull myself in a million directions, running around like a headless chicken and ending up feeling like I hadn't really accomplished much. Ever get that? About a month ago, when I was in Bali, I downloaded a book called "Essentialism: The disciplined pursuit of less"
I had the best two days on the island and I wanted to share all my favourite places and spots with you so if you're planning a trip go check them out. Snorkeling is one of those activities I have always wanted to try but never really had access to. Bali is known for it’s amazing snorkeling locations. Who wouldn’t want their first time snorkeling to be with Manta rays right? For the majority of the past 8 years I have been employed by multiple companies and only gone out on my own for small periods of time in between. I have now arrived at the realisation that in the long term I don't want to work for anyone other then myself. I want to be able to commit my time to me and put as much as my energy and resources into myself as I can. Bali has literally got an infinite amount of things to do, to the point where it can actually be a bit overwhelming. Luckily i'm here for a whole month so there's time to do a lot of it. For someone who is on their first ever solo travel trip I googled a S**t ton of tips before I left South Africa and somehow missed a few essentials. Here are some of my top tips and FYIs for anyone planning to come to Bali who is new to solo travel or South East Asia. The first time I got to travel abroad I was 21. France was breathtaking. As I write this i’m sitting in Hubud, a coworking space in Ubud Bali and life has never felt quite as wide open. Just before heading off to Bali we decided to do a quick overnight 4X4 trip to Gamkaberg Nature Reserve in the Karoo.